The annual Golden World Awards (GWA) initiative, established in 1990 by IPRA (International Public Relations Association), celebrates each year the outstanding achievements of global communication professionals in a variety of categories. Recipients of the award take particular pride in the recognition granted to their entry as meeting international standards of excellence in public relations. The GWA is open to all communication professionals, from such diverse fields as public relations, corporate and internal communications, brand building, and reputation management. Companies, consultancies, associations, institutions, and NGOs can apply. IPRA encourages entries from governments, universities and educational institutions. Applications are possible until May 13. EUPRERA members are entitled to a discount on the GWA entry fee! Ask secgen@ipra.org for the discount code. Aequitas’ pro bono campaign for the Pure Anguilla Foundation saved lives in the aftermath of Hurricane Irma by putting intense pressure on the UK Government to protect its citizens from disaster – and deservedly won a special IPRA Golden World Award. In 2017, Hurricane Irma wreaked devastation across the Caribbean, including the island of Anguilla, a British Overseas Territory. The campaign was designed to force the UK Government to take responsibility for the wellbeing of its citizens in Anguilla, by raising awareness of the devastating impact of Irma in a matter of days. This campaign demonstrates the impact strategic communications can have on Government. Entries for this year’s GWAs open on February 26 and close on May 13. 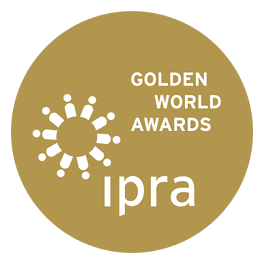 IPRA, the International Public Relations Association, announces that the entries for the Golden World Awards for Excellence (GWA) 2018 are now open. The GWA recognizes excellence in public relations practice worldwide in a variety of categories.